Welcome to our newest feature to our business platform, our Guiri Business Company, Events and Media Location Directory. This is your one-stop source for all professional and business related information in Spain, to help you build your network. We already started compiling a list of our favorite locations, events and interviews, but we need your help to build this resource and keep it up-to-date. The main location category, where you find most of the subcategories for professional and business services. Listing of business focused networking events, seminars, training, classes and conferences, including our monthly Guiri Business Networking drinks. Coming soon, this is the location listing of where we film all our media interviews and reports about best business practices, industry leaders, top locations and much more. Where to add/ find a particular listing? Below the photos on the front page, you find the Search by Category area; select one of the categories (default is Business Listings), and then Search using Subcategories – such as: Marketing/ Communications, Recruiting Services/ Employment Agencies, etc. At the top of the entire page, above the main menu is the Search Bar Area by Keywords. You can search all categories by keywords and proximity. Another way to find a listing is to use the top menu. 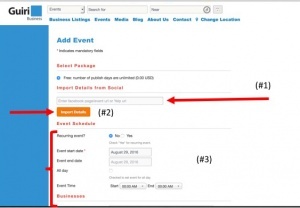 To submit a location and/ or an event, you can easily do this with our Facebook Importer function. 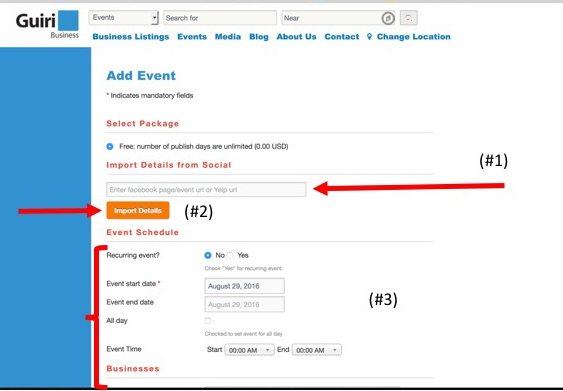 On the Add Event, insert your Facebook url (#1) and select Import Details (#2). Now, the information from the Facebook page should automatically update in the fields (#3). Please check to make sure that all your information is correct, and complete, before submitting this listing for review by clicking on the Submit button at the very bottom. You will be able to go back and update/ correct items at a later date. All submissions are subject to approval by the Guiri Business team and follow the Terms and Conditions of Guiri Business. If your event or location has already been listed by us, or one of your followers, you can also claim that listing as the certified business owner to make edits and additions directly to the page. 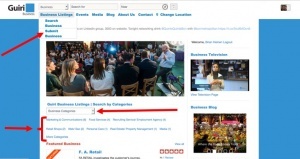 To claim the listing, simple go to the profile page of the location or event, and at the top, find Business Owner? Click there and sign up or login to fill out the information to file your claim. All claims are subject to approval by the Guiri Business team. If for some reason you should want to remove your listing from our site, please contact us here and we will quickly rectify this. This is probably the most important way you can help our community. 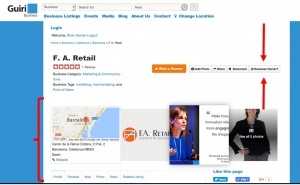 There are many places on our site to add a review of your favorite locations and/ or event. We cannot encourage and appreciate more this critical input from you. Thank you. We hope that you find this section useful. We are open to your feedback below.